The new series from comic genius Jasper Fforde. 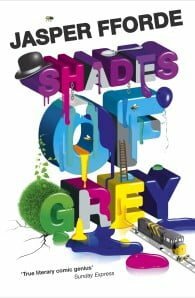 If George Orwell had tripped over a paint pot or Douglas Adams favoured colour swatches instead of towels…neither of them would have come up with anything as eccentrically brilliant as Shades of Grey. Jasper Fforde is a novelist living in Wales. He is the son of John Standish Fforde, the 24th Chief Cashier for the Bank of England. His early career was spent as a focus puller in the film industry, where he worked on a number of films including Quills, GoldenEye, and Entrapment. His published books include a series of novels starring Thursday Next: The Eyre Affair (2001), Lost in a Good Book (2002), The Well of Lost Plots (2003), Something Rotten (2004) and First Among Sequels (2007). The Big Over Easy (2005), which shares a similar setting with the Next novels, is a reworking of his first written novel, which initially failed to find a publisher. It had the working title of Nursery Crime, which is the title now used to refer to this series of books. The follow-up to The Big Over Easy, The Fourth Bear was published in July 2006 and focuses on Goldilocks and the Three Bears.